"Communion of the Apostles" redirects here. For the Barocci painting, see Communion of the Apostles (Barocci). 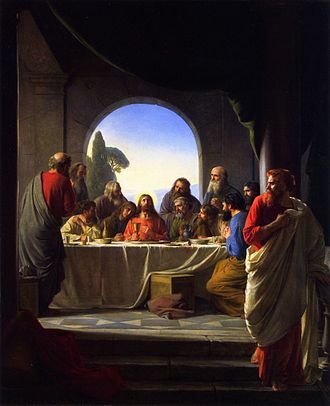 The Last Supper of Jesus and the Twelve Apostles has been a popular subject in Christian art, often as part of a cycle showing the Life of Christ. Depictions of the Last Supper in Christian art date back to early Christianity and can be seen in the Catacombs of Rome. The Last Supper was depicted both in the Eastern and Western Churches. 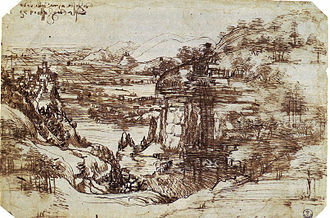 By the Renaissance, it was a favorite subject in Italian art. It was also one of the few subjects to be continued in Lutheran altarpieces for a few decades after the Protestant Reformation. 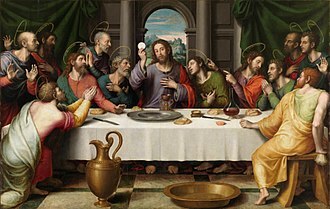 There are two major scenes shown in depictions of the Last Supper: the dramatic announcement of the betrayal of Jesus, and the institution of the Eucharist. After the meal the further scenes of Jesus washing the feet of his apostles and the farewell of Jesus to his disciples are also sometimes depicted. The earliest known written reference to the Last Supper is in Paul's First Epistle to the Corinthians (11:23-26), which dates to the middle of the first century. 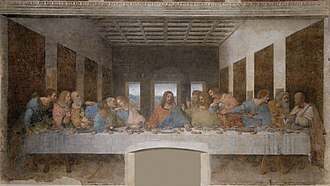 The Last Supper was likely a retelling of the events of the last meal of Jesus among the early Christian community, and became a ritual which referred to that meal. The earliest depictions of such meals occur in the frescoes of the Catacomb of Rome, where figures are depicted reclining around semi-circular tables. In spite of near unanimous assent, the historicity of the evidence, one lone scholar comments that "The motif of the Last supper appears neither among the paintings of the catacombs nor the sculptures on sarcophagi ... The few frescos in the catacombs representing a meal in which Christ and some of the disciples participate show not the Last supper but refer to the future meal promised by the exalted Christ in his heavenly kingdom", seeing the subject as beginning to be depicted in the 6th century. A clearer case is the mosaic in the Church of Sant' Apollinare Nuovo in Ravenna, Italy, where a similar meal scene is part of a cycle depicting the life of Jesus and involves clear representation of him and his disciples. 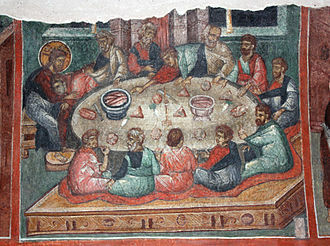 Byzantine artists sometimes used semi-circular tables in their depictions, but more frequently they focused on the Communion of the Apostles, rather than the reclining figures having a meal. The Last Supper was also one of the few subjects to be continued in Lutheran altarpieces for a few decades after the Protestant Reformation, sometimes showing portraits of leading Protestant theologians as the apostles. By the Renaissance, the Last Supper was a favorite subject in Italian art, especially in the refectories of monasteries. 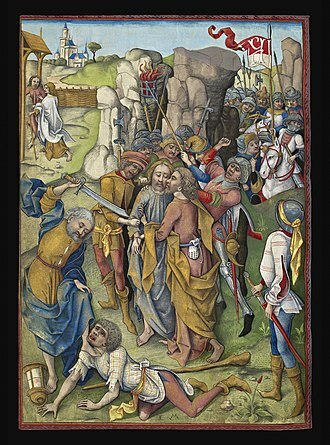 These depictions typically portrayed the reactions of the disciples to the announcement of the betrayal of Jesus. 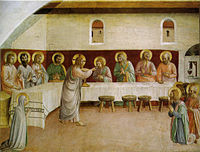 Most of the Italian depictions use an oblong table, and not a semi-circular one, and sometimes Judas is shown by himself clutching his money bag. 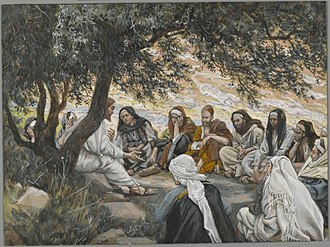 Last Supper by James Tissot, between 1886 and 1894. Tissot shows the Apostles as they most probably were eating the meal, on couches, as it was the custom of the time. With an oblong table, the artist had to decide whether to show the apostles on both sides, so with some seen from behind, or all on one side of the table facing the viewer. Sometimes only Judas is on the side nearest the viewer, allowing the bag to be seen. The placement on both sides was further complicated when halos were obligatory; was the halo to be placed as though in front of the rear-facing apostles faces, or as though fixed to the back of their head, obscuring the view? Duccio, daringly for the time, just omits the halos of the apostles nearest the viewer. 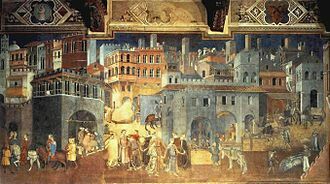 As artists became increasingly interested in realism and the depiction of space, a three-sided interior setting became more clearly shown and elaborate, sometimes with a landscape view behind, as in the wall-paintings by Leonardo da Vinci and Perugino. Artists who showed the scene on a ceiling or in a relief sculpture had further difficulties in devising a composition. Typically, the only apostles easily identifiable are Judas, often with his bag containing thirty pieces of silver visible, John the Evangelist, normally placed on Jesus's right side, usually "reclining in Jesus' bosom" as his Gospel says (see below), or even asleep, and Saint Peter on Jesus's left. 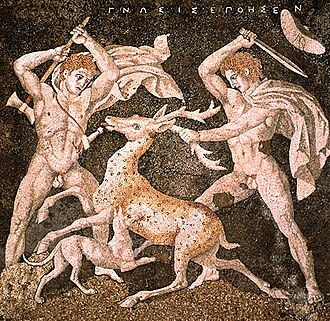 The food on the table often includes a paschal lamb; in Late Antique and Byzantine versions fish was the main dish. In later works the bread may become more like a communion host, and more food, eating, and figures of servers appear. 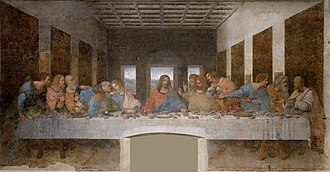 There are two major episodes or moments depicted in Last Supper scenes, each with specific variants. There are also other, less frequently depicted scenes, such as the washing of the feet of the disciples. 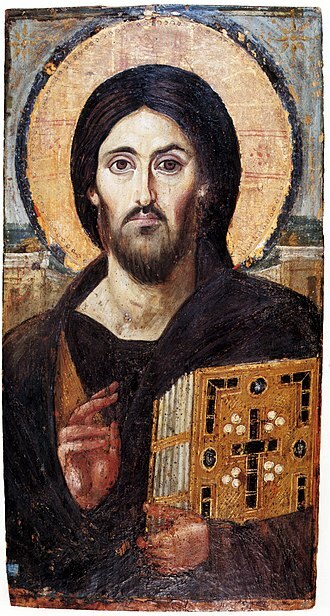 Especially in Eastern depictions, Judas may only be identifiable because he is stretching out his hand for the food, as the other apostles sit with hands out of sight, or because he lacks a halo. In the West he often has red hair. 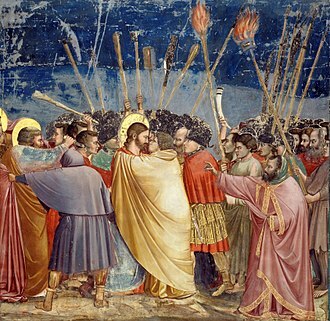 Sometimes Judas takes the sop in his mouth directly from Jesus' hand, and when he is shown eating it a small devil may be shown next to or on it. The betrayal scene may also be combined with the other episodes of the meal, sometimes with a second figure of Christ washing Peter's feet. 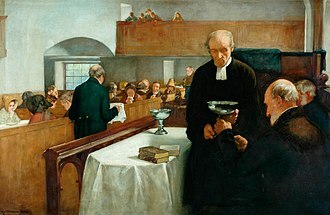 The second scene shows the institution of the Eucharist, which may be shown as either the moment of the consecration of the bread and wine, with all still seated, or their distribution in the first Holy Communion, technically known in art history as the Communion of the Apostles (though in depictions set at the table the distinction is often not made), which is common in very early depictions and throughout Byzantine art, and in the West reappears from the 14th century onwards. The depictions of both scenes are generally solemn and mystical; in the latter Jesus may be standing and delivers the communion bread and wine to each apostle, like a priest giving the sacrament of Holy Communion. 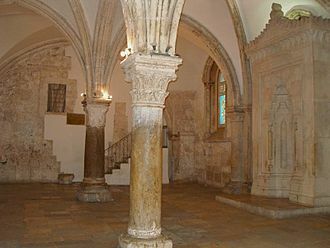 In early and Eastern Orthodox depictions the apostles may queue up to receive it, as though in a church, with Jesus standing under or next to a ciborium, the small open structure over the altar, which was much more common in Early Medieval churches. An example of this type is in mosaic in the apse of the Saint Sophia Cathedral in Kiev, under a very large standing Virgin. 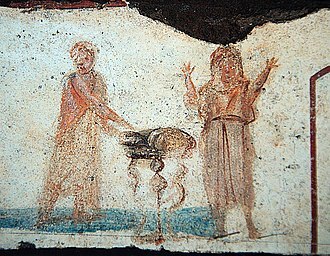 The washing of feet was an element of hospitality normally performed by servants or slaves, and a mark of great respect if performed by the host. It is recorded in John 13:1-15, as preceding the meal, and subsequently became a feature of Holy Week liturgy and year-round monastic hospitality at various times and places, being regularly performed by the Byzantine emperors on Maundy Thursday for example, and at times being part of English Royal Maundy ceremonies performed by the monarch. For a while it formed part of the Baptism ceremony in some places. It mostly appears in cycles of the Passion of Jesus, often next to the Last Supper meal and given equal prominence, as in the 6th century St Augustine Gospels and 12th century Ingeborg Psalter, and also may appear in cycles of the Life of Saint Peter. 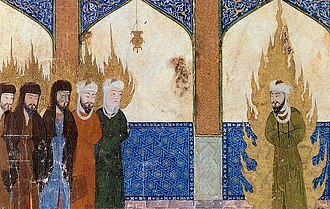 Where space is limited only Jesus and Peter may be shown, and many scenes show the amazement of Peter, following John. A number of scenes appear on 4th century sarcophagi, in one case placed to correspond with a scene of Pontius Pilate washing his hands. Some types show Jesus standing as he is confronted by Peter; in others he is bending or kneeling to perform the washing. The subject had various theological interpretations which affected the composition, but gradually became less common in the West by the Late Middle Ages, though there are at least two large examples by Tintoretto, one originally paired with a Last Supper. The last episode, far less commonly shown, is the farewell of Jesus to his disciples, in which Judas Iscariot is no longer present, having left the supper; it is mostly found in Italian trecento painting. The depictions here are generally melancholy, as Jesus prepares his disciples for his departure. The Passion of Christ, circa 1485−1490 (Old Saint Peter's Church, Strasbourg). John leans across, and Judas in yellow carries his thirty pieces of silver in a bag. The dwarfish figure below represents the painting's donator. Pietro Perugino's depiction (c. 1490) in Florence shows Judas sitting separately, and is considered one of Perugino's best pieces. 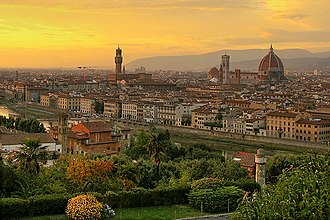 It is located in the convent that housed noble Florentine girls. Upon its rediscovery was initially attributed to Raphael. 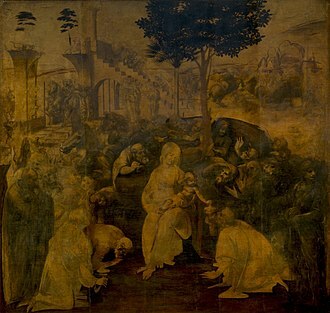 Leonardo da Vinci's depiction (late 1490s) which is considered the first work of High Renaissance art due to its high level of harmony, uses the first theme. Leonardo balanced the varying emotions of the individual apostles when Jesus stated that one of them would betray him, and portrayed the various attributes of anger, surprise and shock. It is likely that Leonardo da Vinci was already familiar with Ghirlandaio's Last Supper, as well as that of Castagno, and painted his own Last Supper in a more dramatic form to contrast with the stillness of these works, so that more emotion would be displayed. Tintoretto's depiction (1590–1592) at the Basilica di San Giorgio Maggiore in Venice, also depicts the announcement of the betrayal, and includes secondary characters carrying or taking the dishes from the table. There are far more numerous secondary figures in the huge painting now called The Feast in the House of Levi by Veronese. This was delivered in 1573 as a Last Supper to the Dominicans of Santi Giovanni e Paolo, Venice for their refectory, but Veronese was called before the Inquisition to explain why it contained "buffoons, drunken Germans, dwarfs and other such scurrilities" as well as extravagant costumes and settings, in what is indeed a fantasy version of a Venetian patrician feast. Veronese was told that he must change his painting within a three-month period - in fact he simply changed the title to the present one, still an episode from the Gospels, but a less doctrinally central one, and no more was said. The altarpiece of the main church in Martin Luther's home of Wittenberg is by Lucas Cranach the Elder (with his son and workshop), with a traditional representation of the Last Supper in the main panel, except that the apostle having a drink poured is a portrait of Luther, and the server may be one of Cranach. 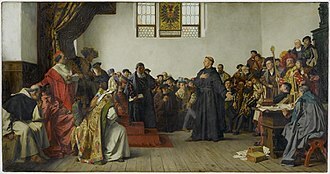 By the time the painting was installed in 1547, Luther was dead. 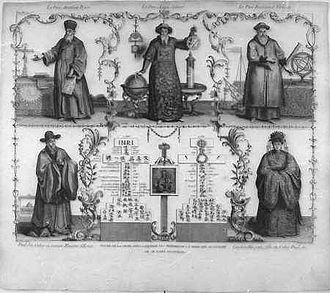 Other panels show the Protestant theologians Philipp Melanchthon and Johannes Bugenhagen, pastor of the church, though not in biblical scenes. Other figures in the panels are probably portraits of figures from the town, now unidentifiable. Another work, the Altarpiece of the Reformers in Dessau, by Lucas Cranach the Younger (1565, see gallery) shows all the apostles except Judas as Protestant churchmen or nobility, and it is now the younger Cranach shown as the cupbearer. 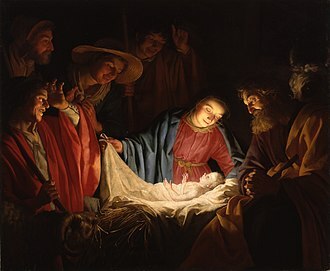 However such works are rare, and Protestant paintings soon reverted to more traditional depictions. In Rubens' Last Supper, a dog with a bone can be seen in the scene, probably a simple pet. It may represent faith, dogs are traditionally symbols of and are representing faith. According to J. Richard Judson the dog near Judas, it perhaps representing greed, or representing the evil, as the companion of Judas, as in John 13:27. The Sacrament of the Last Supper, Salvador Dalí's depiction, combines the typical Christian themes with modern approaches of Surrealism and also includes geometric elements of symmetry and polygonal proportion. Judas reaches for the food; School of Monte Cassino, c. 1100, Sant'Angelo in Formis, Capua, still using Roman couches. Giotto, Scrovegni Chapel, 1305, with flat perspectival haloes; the view from behind causes difficulties, and John's halo has to be reduced in size. Protestant version by Lucas Cranach the Younger, 1565, with leading Reformers portrayed as the Apostles, and the Elector of Saxony kneeling. ^ Schiller, 42-47; National Gallery, London for the paired Tintoretto, an even larger one is in the Prado. ^ Viladesau, Richard (2014). The Pathos of the Cross: The Passion of Christ in Theology and the Arts – the Baroque Era. Oxford University Press. p. 26. Retrieved February 13, 2015. Tilman Riemenschneider was a German sculptor and woodcarver active in Würzburg from 1483. 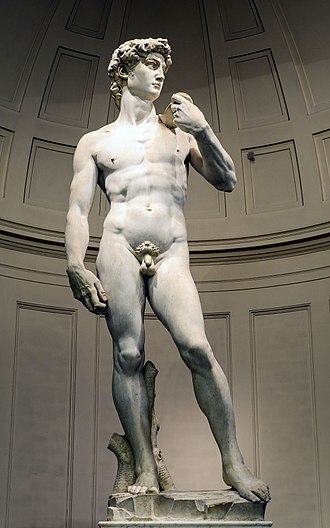 He was one of the most prolific and versatile sculptors of the period between late Gothic and Renaissance, a master in stone and limewood. Tilman Riemenschneider was born around the year 1460 at Heiligenstadt im Eichsfeld in present-day Thuringia, when Riemenschneider was about five years old, his father was involved in a violent political conflict, the Mainzer Stiftsfehde, so the family had to leave Heiligenstadt and all their possessions. They resettled in Osterode, where his father became Master of the Mint, Riemenschneider likely came to Würzburg for the first time at the age of 18 in 1478/9. 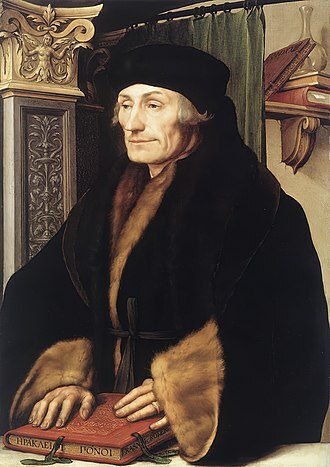 His uncle served as notary and financial advisor to the bishop there, around 1473, Riemenschneider learned the trade of sculpting and woodcarving, likely in Swabia or the Upper Rhine — possibly in Strasbourg and/or Ulm. At that time, the statutes of the guild of sculptors required that a travel to many different workshops to gain experience. Very little is known about this period of his life, but he came in contact with the work of Martin Schongauer. In 1483, he settled in Würzburg, on 7 December 1483, he joined the Saint Lukes Guild of painters and glass workers as a painters assistant. On 28 February 1485, he married Anna Schmidt, a widow of a goldsmith with three sons. This marriage not only brought him property, but it meant that he could end his apprenticeship. Also in 1485, Riemenschneider became a citizen of Würzburg, which made it possible to attain the status of master craftsman and his earliest confirmed work is the gravestone of Eberhard von Grumbach in the Pfarrkirche at Rimpar. 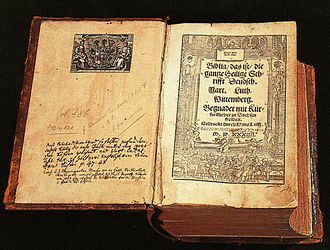 This may be the type of work he started out with before obtaining large church commissions and he started to receive numerous orders from the town councils of Würzburg and neighboring towns. In 1490, the council of Münnerstadt ordered an altarpiece for the altar of St Maria Magdalena, the parish church. In 1491, the council of Würzburg ordered two life-sized stone figures of Adam and Eve for the south portal of the councils church. Fra Angelico was an Early Italian Renaissance painter described by Vasari in his Lives of the Artists as having a rare and perfect talent. He was known to contemporaries as Fra Giovanni da Fiesole and Fra Giovanni Angelico, in modern Italian he is called il Beato Angelico, the common English name Fra Angelico means the Angelic friar. In 1982 Pope John Paul II proclaimed his beatification in recognition of the holiness of his life and he is listed in the Roman Martyrology as Beatus Ioannes Faesulanus, cognomento Angelicus—Blessed Giovanni of Fiesole, surnamed the Angelic. 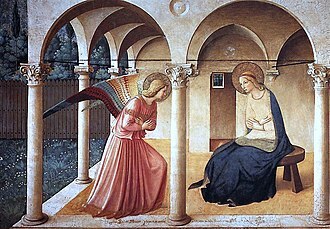 Fra Angelico was born Guido di Pietro at Rupecanina in the Tuscan area of Mugello near Fiesole towards the end of the 14th century, nothing is known of his parents. He was baptized Guido or Guidolino, the earliest recorded document concerning Fra Angelico dates from October 17,1417 when he joined a religious confraternity or guild at the Carmine Church, still under the name of Guido di Pietro. The first record of Angelico as a friar dates from 1423, Fra, a contraction of frater, is a conventional title for a mendicant friar. 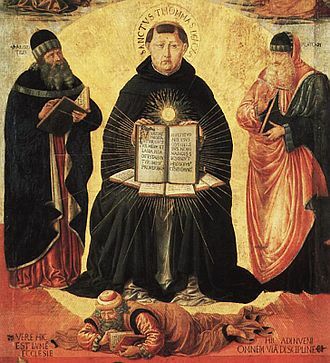 According to Vasari, Fra Angelico initially received training as an illuminator, possibly working with his older brother Benedetto who was a Dominican and an illuminator. The former Dominican convent of San Marco in Florence, now a state museum, the painter Lorenzo Monaco may have contributed to his art training, and the influence of the Sienese school is discernible in his work. He had several important charges in the convents he lived in, but this did not limit his art, according to Vasari, the first paintings of this artist were an altarpiece and a painted screen for the Charterhouse of Florence, none such exist there now. Between 1418 and 1436 he was at the convent of Fiesole, where he executed a number of frescoes for the church and the Altarpiece. A predella of the Altarpiece remains intact and is conserved in the National Gallery, London and it shows Christ in Glory surrounded by more than 250 figures, including beatified Dominicans. In 1436, Fra Angelico was one of a number of the friars from Fiesole who moved to the newly built convent or friary of San Marco in Florence, in 1439 Fra Angelico completed one of his most famous works, the San Marco Altarpiece at Florence. Saint Sophia Cathedral in Kyiv is an outstanding architectural monument of Kievan Rus. The cathedral is one of the citys best known landmarks and the first heritage site in Ukraine to be inscribed on the World Heritage List along with the Kyiv Cave Monastery complex. 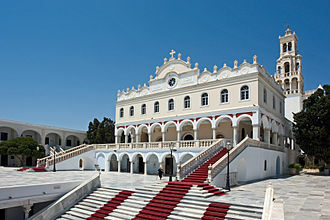 Aside from its building, the cathedral includes an ensemble of supporting structures such as a bell tower. In 2011 the historic site was reassigned from the jurisdiction of the Ministry of Regional Development of Ukraine to the Ministry of Culture of Ukraine, in Ukrainian the cathedral is known as Sobor Sviatoyi Sofiyi or Sofiyskyi sobor. In Russian it is known as Sobor Svyatoi Sofii or Sofiyskiy sobor, the cathedrals name comes from the 6th-century Hagia Sophia cathedral in Constantinople. The first foundations were laid in 1037 or 1011, but the cathedral took two decades to complete. This info has been accepted by both UNESCO and Ukraine, which celebrated the 1000th anniversary of the cathedral during 2011. )The structure has 5 naves,5 apses. It is surrounded by galleries from three sides. Measuring 37 to 55 m, the used to be faced with plinths. On the inside, it retains mosaics and frescos from the 11th century, including a representation of Yaroslavs family. After the pillaging of Kiev by Andrei Bogolyubsky of Vladimir-Suzdal in 1169, followed by Mongolian Tatars in 1240 and it was greatly damaged in the 16th century, when Poland and Ukraine were trying to unite catholic and orthodox churches. At this period the Cathedral was almost ruined, its roof decayed, following the 1595-96 Union of Brest, the Cathedral of Holy Sophia belonged to the Ukrainian Greek Catholic Church until it was claimed by the Moldavian Orthodox metropolitan Peter Mogila in 1633. The work continued under the Cossack Hetman Ivan Mazepa until 1767, all of these buildings as well as the Cathedral after the reconstruction have distinctive features of Ukrainian Baroque. The cathedral was saved from destruction primarily with the effort of many scientists, since the late 1980s Soviet, and Ukrainian, politicians promised to return the building to the Orthodox Church. Duccio di Buoninsegna was an Italian painter active in Siena, Tuscany in the late 13th and early 14th centuries. He is considered to be the father of Sienese painting and, along with a few others and he was hired throughout his life to complete many important works in government and religious buildings around Italy. Duccio is credited with creating the painting styles of Trecento and the Sienese school, although much is still unconfirmed about Duccio and his life, there is more documentation of him and his life than of other Italian painters of his time. 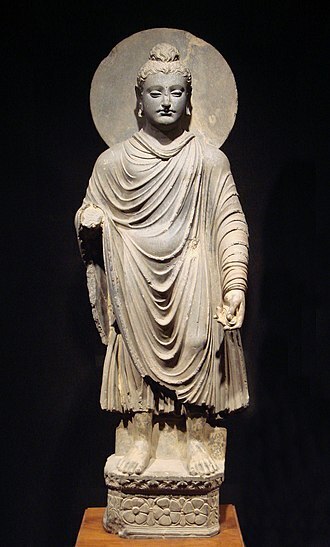 It is known that he was born and died in the city of Siena, other details of his early life and family are as uncertain, as much else in his history. One avenue to reconstructing Duccios biography are the traces of him in archives that list when he ran up debts or incurred fines, some records say he was married with 7 children. The relative abundance of archival mentions has led historians to believe that he had difficulties managing his life, another route to filling in Duccios biography are by analyzing the works that can be attributed to him with certainty. Information can be obtained by analyzing his style, the date and location of the works, due to gaps where Duccios name goes unmentioned in the Sienese records for years at a time, scholars speculate he may have traveled to Paris and Rome. Nevertheless, his talents were enough to overshadow his lack of organization as a citizen. 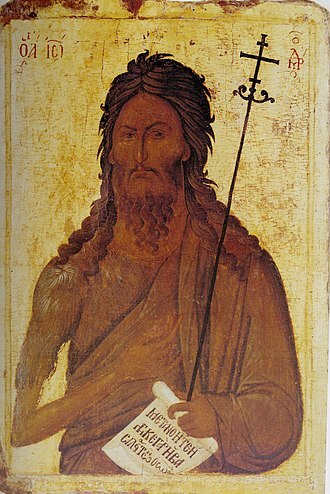 In the 14th century Duccio became one of the most favored, where Duccio studied, and with whom, is still a matter of great debate, but by analyzing his style and technique art historians have been able to limit the field. Little is known of his career prior to his first documented commission. In 1278, at the age of 23, he was hired to paint 12 wooden panels to cover government documents for The Nine, although Duccio was active from 1268 to about 1311 only approximately 13 of his works survive today. Furthermore, of Duccios surviving works, only two can be securely dated, Duccios known works are on wood panel, painted in egg tempera and embellished with gold leaf. Different from his contemporaries and artists before him, Duccio was a master of tempera and managed to conquer the medium with delicacy, there is no clear evidence that Duccio painted frescoes.